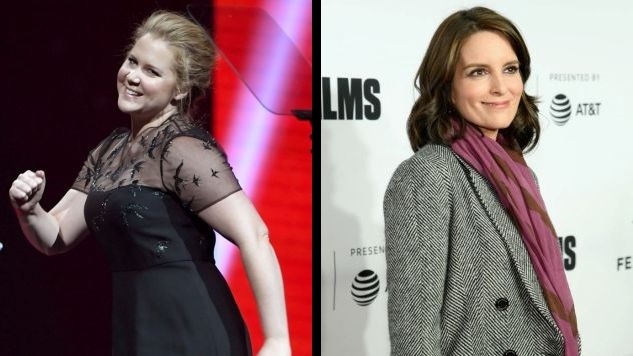 Saturday Night Live ’s going out on an all-woman twofer this season. The last two episodes of the season will be hosted by Amy Schumer and Tina Fey, with Kacey Musgraves and Nicki Minaj as the musical guests, respectively. Schumer’s episode will air on May 12, and Fey’s will shut the show down until the fall on May 19. Fey, of course, is one of the most popular SNL cast members and writers of all time. She’ll be returning for her fifth go-round as host, so you can probably expect to see her in a satin and velveteen robe emblazoned with a Five-Timers Club shield. Schumer will be hosting for the second time, and in vastly different circumstances from her first episode in 2015; at the time coming off the hit movie Trainwreck and the critically beloved, Peabody Award-winning sketch show Inside Amy Schumer, she now finds herself roundly criticized on the internet for almost every single thing she does. Her new movie, I Feel Pretty, opens tomorrow, and has been widely condemned in certain circles for its concept; just go watch the trailer if you want to see what the controversy is about. Fey and Schumer’s episodes will be the second and third episodes in May, after the Donald Glover double-bill on May 5. The Atlanta star (and 21st century Lando) will be hosting and performing as the musical guest under his Childish Gambino alter ego.